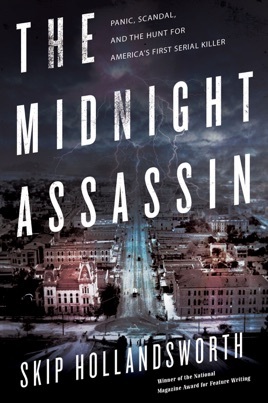 A New York Times bestseller, The Midnight Assassin is a sweeping narrative history of a terrifying serial killer--America's first--who stalked Austin, Texas in 1885. Fans of Erik Larson's Devil in the White City will relish this gripping and atmospheric account of a horrific series of murders in late 19th-century Texas that are largely obscure today, despite their fantastical elements and similarities to the Jack the Ripper butcheries. Texas Monthly editor Hollandsworth provides the definitive account of the killings that began on New Year's Eve 1884, when someone attacked African-American cook Mollie Smith, stabbing her repeatedly and nearly splitting her head in two. With a novelist's eye for detail, the author brings the reader inside the reign of terror that gripped Austin, Tex., as the killer "crisscrossed the entire city, striking on moonlit nights, using axes, knives, and long steel rods to rip apart women from every race and class." Hollandsworth successfully conveys the horror of the crimes, the baffling lack of an obvious motive, the so-called Midnight Assassin's almost supernatural ability to strike twice in less than an hour, and the ineffective official responses to the murders. This true crime page-turner is a balanced and insightful examination of one of the most stirring serial killing sprees in American history, and certainly one of the least well-known. Skip Hollandsworth is my favorite "Texas Monthly" contributor - and I think this book clearly shows that's for good reason. In my experience, the inexplicable nature of still-unresolved mysteries tends to inhibit the sort of "gravitational pull" of narratives spun around them; however, Hollandsworth has plied his considerable talents in having written what is, ultimately, an engrossing, affecting, page-turner of a book about a century-old killer to whose identity few clues have ever been collected and will almost certainly never be known. This is not to say that you won't be disappointed at the end of this thrilling story; rather, that this disappointment will almost certainly stem from the realization that you've run out of pages to read, not from the lack of a tidy and well-supported solution. I don't usually not finish a book, but this was not written very well. Lots of detail (too much?) without ever fleshing out the characters. The style is kind of stiff. I really wanted this to be like "Devil In The White City", but it wasn't remotely close. Lots of facts, not much feeling. This book explored a frightening period in the history of Austin, Texas, as well as a terrifying first for the U.S., namely, a review of the facts & circumstances of the first serial killer in its history. While obviously very well researched, I felt it delved into a bit too much detail which detracted from the story itself. The fact that there was no guilty party found also limited the enjoyment of the book leaving the reader with on satisfactory open ended tale.